The Brewers were satisfied with the talent at Florida's Colonial Classic high school baseball tournament. They just had to point to a player they spotted two years earlier: Chris Cassels. ''Whenever you have teams in from all over the nation, it's good for the scouts,'' Brewers scout Jim Gabella told The Orlando Sentinel in March 1988. "It's good to see talent from other parts of the country and make comparisons to players you see here. Two years ago we got a good look at Chris Cassels Gonzalez Tate and ended up signing him, and he hit .382 his first year of pro ball." Cassels had that hot start with the Brewers in 1987, but he couldn't keep it up. He went on to play in six seasons in the minors and seven more in independent ball. He never made AAA. Cassels' career began in 1986, taken by Milwaukee in the 31st round of the draft out Pensacola, Fla.'s Gonzalez Tate High School. Cassels didn't hit the field for the Brewers until 1987 at short-season Helena. He got into 60 games and hit .373. He had a sacrifice fly in an August game. He moved to single-A Beloit for 1988. His average dropped to .277. He hit 11 home runs and had 60 RBI. His average then dropped again in 1989 at single-A Stockton to .242. Cassels returned to Stockton for 1990, hitting .284 over 93 games. He then switched to the Expos system and made AA Harrisburg. He started strong there, hitting home runs on consecutive early-April nights. Overall, he hit .221, with 13 home runs. 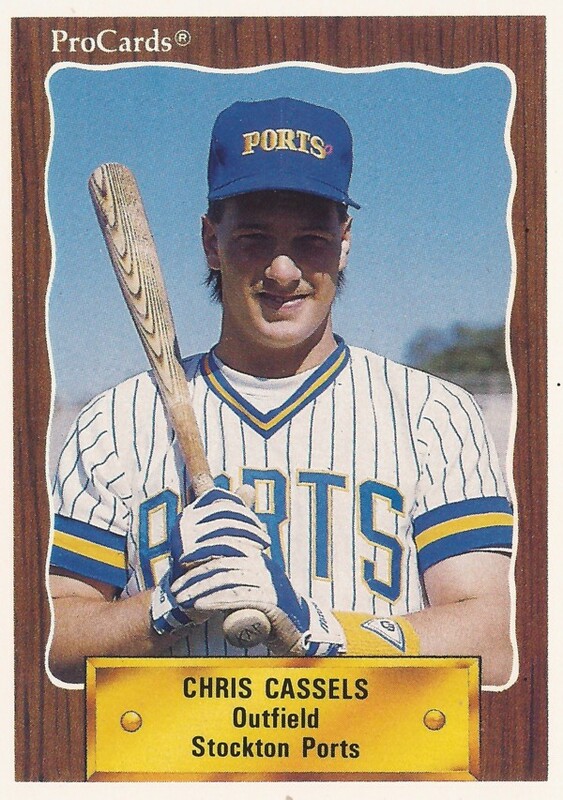 Cassels got into one more minor league season, getting 40 games with the Expos at rookie ball and high-A in 1992, ending his affiliated career. Cassels then is recorded as returning in 1995 with independent Rio Grande Valley. He hit .269. After another year off, he played 1997 at independent Tyler, then 1998 at Bayou. He made the 1998 Texas-Louisiana League All-Star team. "It's an honor to make the All-Stars," Cassels told The Amarillo Globe-News of his 1998 selection. "When you know it's the other managers who voted on the team, it's an honor to make it. He arrived at independent Greenville for 1999 and played there for two years. He then jumped to Baton Rouge and served as a player-manager for 2001 and 2002, ending his career.